Honee founder and CEO, Matt Jones, admits he knows way too much about the beauty industry. He chuckles when asked how and why he finds himself immersed in the beauty and wellness space - and the reason behind his mission to help digitise the industry. “There are some serious problems in the beauty industry. Nothing is digitised. No one has a website and a third of bookings happen outside of opening hours, so if they don’t have online bookings, they are missing out on a third of their business,” Jones tells CIO Australia. In order to make a difference, Jones hatched Honee, a tech start-up that’s propelling the beauty and wellness industry into the digital age. The end-to-end booking service and online shopfront - which offers 200,000 services - aims to revolutionise the way beauty, fitness and wellness companies do business, through connecting everyday consumers with venues in their surrounding communities. Essentially, Honee aims to make it easy to find wellness, beauty and fitness venues in Melbourne and Sydney by providing customers with accurate and up-to-date information on venues, as well as helping businesses promote their brands and find new clients. It also aims to help salons get access to actionable feedback, save time and drive rebookings. Jones said Honee has simplified the process for businesses by allowing customers to book, pay, cancel and review directly through the platform, taking a load off salon owners and their employees. It also enables salons to build a comprehensive digital marketing strategy and to take steps towards transforming their businesses. “It’s a brutally hard place to do business, so we really wanted to help these people,” Jones said, explaining the service is now resonating with users - particularly 'regular' salon customers - and businesses alike. 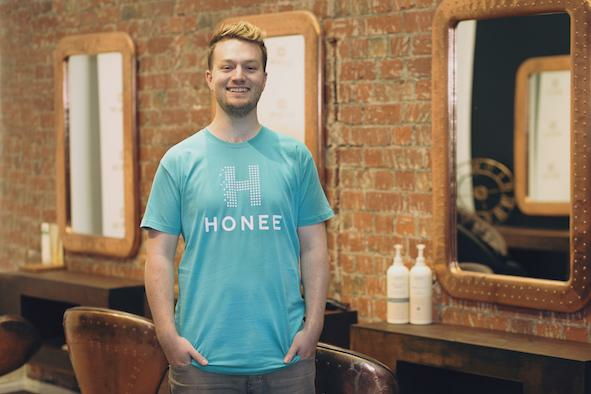 Of 10,000 salons across Sydney and Melbourne surveyed by the Honee team, less than 40 per cent had a web presence and 0.2 per cent of bookings were made online. Jones said the beauty and wellness industry - unlike other industries - has been slow to adopt transformational change and to make any real significant inroads in the digital age. But he wanted to change all that - and act as a bridge between people looking for a service and those who offer it, and make the journey across that bridge as easy as possible. Already, the company is celebrating a major milestone, boasting it’s on track to hit $1 million a week in transaction volume. Its traffic has doubled in the past 3 months, and there’s an increase from 50,000 to 100,000 users per month. So how did it all being? Jones - a commercial banker for ANZ for about seven years - said he was always destined for an entrepreneurial life, but never dreamed the beauty business was in the cards. “I always had startups in my blood. During university I nearly failed two degrees from doing two different startups, rather than actually studying. I made quite a bit of money from that. I then eventually wrapped it up and focused on uni and followed the corporate path. From there, he ventured overseas, working in Berlin for Delivery Hero, and then headed across to Singapore to work for another start up, Quandoo Live, which developed a table reservation app. He eventually joined Zomato, a restaurant search and discovery service founded in 2008 by Indian entrepreneurs Deepinder Goyal and Pankaj Chaddah. It currently operates in 23 countries, including Australia and the US. Back in Australia, he helped Zomato with the acquisition of Urbanspoon. “Zomato bought Urbanspoon for $70 million and they needed someone who’s done this before. I had re trained sales team after acquisitions. I had done a lot of this previously and I was probably the most prominent food tech guy in Australia. At that point, he - and his team - realised they had to venture out on their own. Initially, the Honee concept started as a discovery platform - and the team physically walked the streets. “We covered 10,000 square kilometres across Melbourne and Sydney. We found 10,000 salons like literally walking down every street. We had an app, we got their GPS coordinates, menus, clients, descriptions, inside and outside photos. We got pretty much everything you needed for a user to find a great treatment, and we stuck it all online.” At first, the concept wasn’t generating revenue. But eventually, the company found its niche and worked to alleviate some of the challenges associated with the beauty industry, from users struggling to find venues to a lack of digital marketing know-how by countless beauty and wellness operations. In addition to helping users, Honee has also enabled salons to market to thousands of consumers, by providing them with information that helps leverage their customer relationship and grow their business. “Many salon owners drop $1 million on a really good location (on Chapel Street or George Street) for a fit out, but the average lifespan is only ten months,” he said, explaining businesses are so prone to collapse for a variety of reasons, and need help building one-on-one customer relationships. The platform also offers business advice. An AI-powered chatbot and business information service ‘Nectar’ lets business owners ask a number of different questions about their business and receive an answer immediately. Asked his next steps, Jones said he’s trying to raise capital in the US, and is looking for partners to help it grow internationally. “Australia isn’t a big market. It’s $10 billion. We can carve that out over the next few years in multiple cities. It will grow. We already have a strong presence in Melbourne and Sydney. So the next markets we need are Los Angeles and some of the more sophisticated beauty markets including Singapore, Hong Kong, Dubai and Delhi. “I don’t want to give it all away, but we have some pretty strong partners helping with our APAC expansion,” he said, revealing Zomato is helping Honee with its growth plans. And while he’s looking to expand the business globally, he loves the exciting and frenzied start up atmosphere in Australia, particularly with the rise of the incubators, accelerator programs and the injection of government funding over the last two years. “It’s now very well networked. The Aussie market is second to none. I truly believe that in terms of being able to get in front of people. You go to Silicon Valley and you really need warm intros, but over here, it’s very easy to get in front of venture capitals. All of the VCs are incredibly connected and there are a couple of hubs. No doubt, he loves living and breathing life as an entrepreneur. “I wouldn’t do anything else. I love it. It’s addictive. It is work-life integration. It really is. It is time on the weekends. It is seven days a week, 18 to 19 hours a day. It is a constant challenge. “It’s hectic, but I’m a problem solver at heart. I grew up in the age where we’d build computers. We’d go to a computer swap meet and we’d find motherboards, we’d find hard drives. We’d stick it all together, and by default nothing worked. You had to figure it out for yourself.